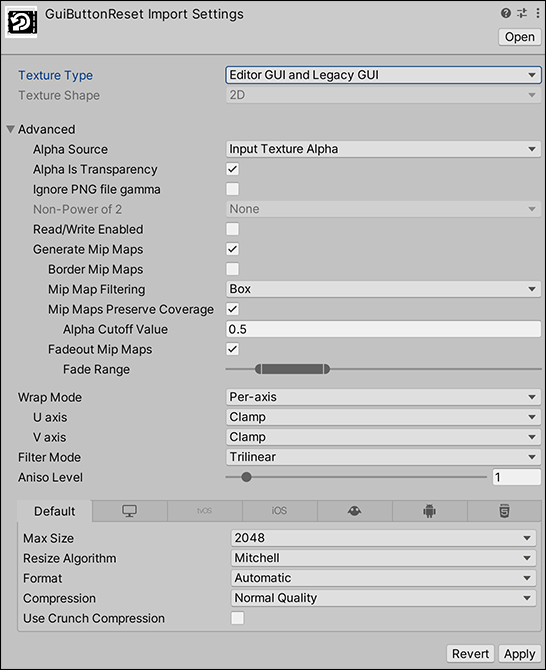 See in Glossary types into the Unity Editor via the Texture Importer. See in Glossary window. Scroll down or select from the list below to find details of the Texture type you wish to learn about. 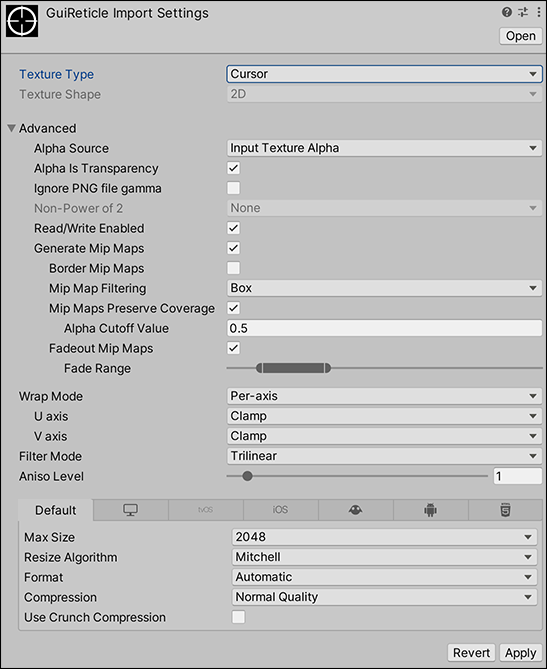 For details on the Advanced settings and platform-specific settings, see documentation on the Texture Importer. Texture Type Default is the most common setting used for all Textures. 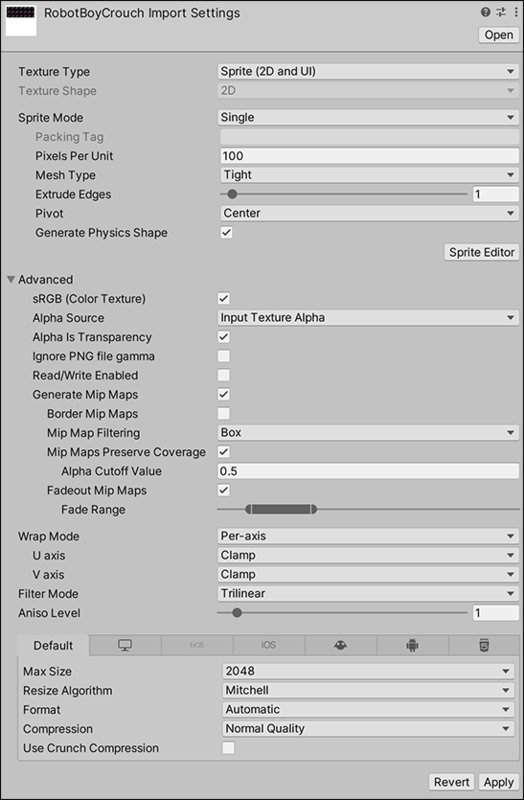 It provides access to most of the properties for Texture importing. Texture Shape Use this to define the shape of the Texture. See documentation on the Texture Importer for information on all Texture shapes. See in Glossary (for example, the smoothness or the metalness), uncheck this box. This box is checked by default. Alpha Source Use this to specify how the alpha channel of the Texture is generated. This is set to None by default. None The imported Texture does not have an alpha channel, whether or not the input Texture has one. Input Texture Alpha This uses the alpha from the input Texture if a Texture is provided. 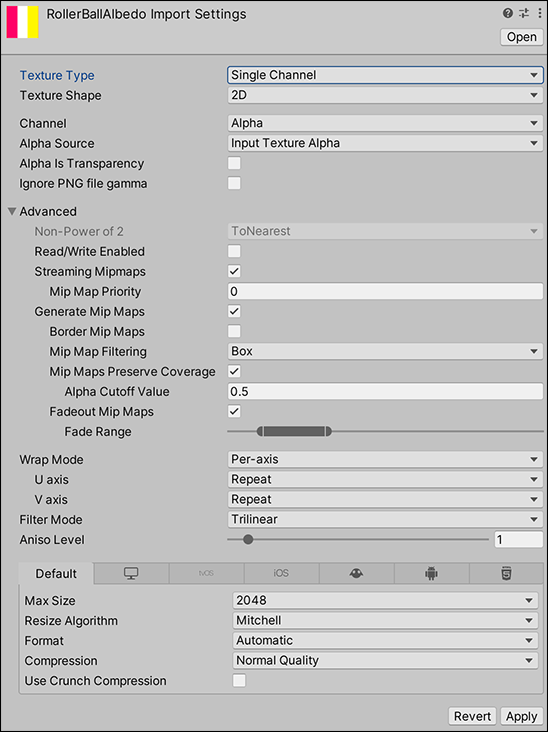 From Gray Scale This generates the alpha from the mean (average) of the input Texture RGB values. Alpha is Transparency If the alpha channel you specify is Transparency, enable Alpha is Transparency to dilate the color and avoid filtering artifacts on the edges. Texture Type Select Normal map to turn the color channels into a format suitable for real-time normal mapping. 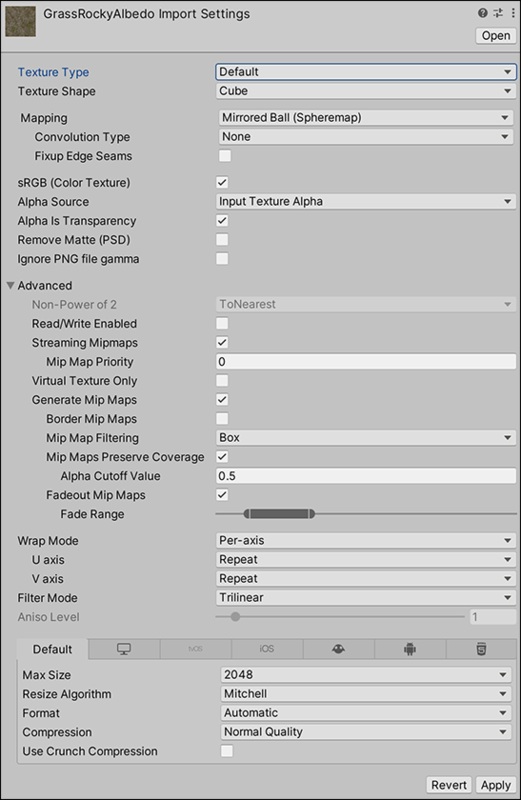 Create from Greyscale This creates the Normal Map from a greyscale heightmap. Check this to enable it and enabled it and see the Bumpiness and Filtering. This option is unchecked by default. Bumpiness Control the amount of bumpiness. 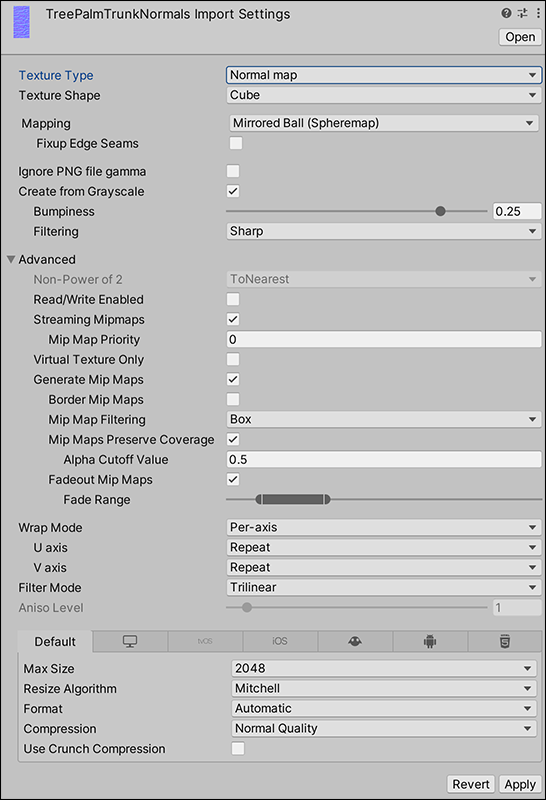 A low bumpiness value means that even sharp contrast in the heightmap is translated to gentle angles and bumps. A high value creates exaggerated bumps and very high-contrast lighting responses to the bumps. This option is only visible if Create from Greyscale is checked. Smooth This generates Normal Maps with standard (forward differences) algorithms. Sharp Also known as a Sobel filter, this generates Normal Maps that are sharper than Standard. Texture Type Select Editor GUI and Legacy GUI if you are using the Texture on any HUD or GUI controls. Sprite mode Use this setting to specify how the the Sprite graphic is extracted from the image. The default for this option is Single. Single Use the Sprite image in isolation. Multiple Keep multiple related Sprites together in the same image (for example, animation frames or separate Sprite elements that belong to a single game character). See in Glossary which you want to pack this Texture into. See in Glossary of width/height in the Sprite image that correspond to one distance unit in world space. See in Glossary type that is generated for the Sprite. The default for this option is Tight. See in Glossary to map the Sprite onto it. Tight This generates a Mesh based on pixel alpha value. The Mesh generated generally follows the shape of the Sprite. Note: Any Sprite that is smaller than 32x32 uses Full Rect, even when Tight is specified. Extrude EdgesA Texture property that enables you to define how much area to leave around a sprite in a generated mesh. See in Glossary Use the slider to determine how much area to leave around the Sprite in the generated Mesh. Pivot The location in the image where the Sprite’s local coordinate system originates. Choose one of the pre-set options, or select Custom to set your own Pivot location. Custom Define the X and Y to set a custom Pivot location in the image. Texture Type Select Cursor if you are using the Texture as a custom cursor. Light Type Define the type of Light that the Texture is applied to. Directional and Spotlight cookies must be 2D Textures, and Point Light Cookies must be cubemaps. The system automatically enforces the right shape depending on the Light type. For Directional Lights this Texture tiles, so in the Texture inspector set the Edge Mode to Repeat. For Spotlights, keep the edges of your Cookie Texture solid black to get the proper effect. In the Texture Inspector, set the Edge Mode to Clamp. 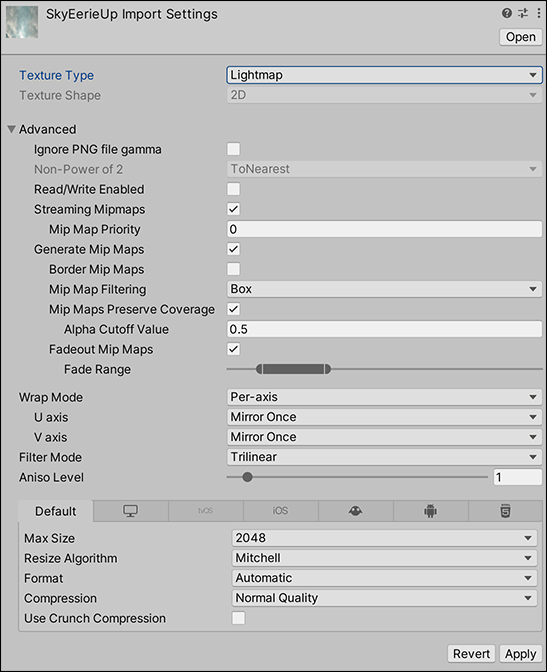 See in Glossary if you are using the Texture as a Lightmap. 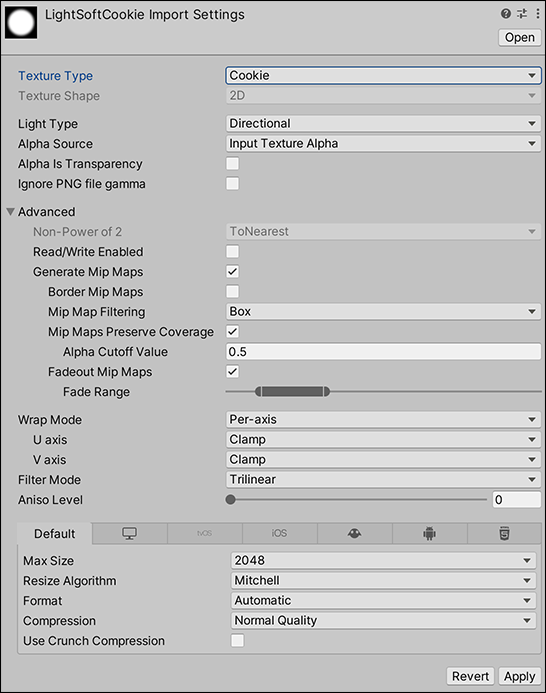 This option enables encoding into a specific format (RGBM or dLDR, depending on the platform) and a post-processing step on Texture data (a push-pull dilation pass). Texture Type Select Single Channel if you only need one channel in the Texture.